Juniper Ridge Campfire Incense is the only incense anywhere made with 100% wild-harvested leaves, wood and resins from the mountains of the great Pacific North West―no perfumey stuff, no added scents, no fake anything.Sweetgrass is found in alpine meadows throughout the mountainous regions of the West, from Alaska south to the Rockies and Sierra Nevada. It is one of the treasured plants of native tribes in Canada and the American West, who use it ceremonially along with White Sage. 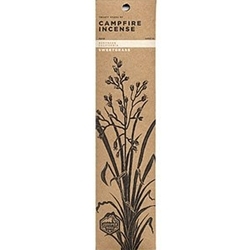 When burned Juniper Ridge Campfire Sweetgrass Incense has a lovely, soft, vanilla-like scent and a centering energy that evokes the ephemeral, shimmering green mountain meadows where the sweetgrass grows.